If you’ve never experienced the outback, then autumn is the ideal season to pack your swag, grab your Akubra and join us as we head west across the Great Dividing Range and into Outback Queensland. That vast expanse of wide brown landscapes and shimmering horizons offers up a pallet of colours from ochre and brown to the pink skies of a blazing sunset. There are the iconic attractions like the Australian Stockman’s Hall of Fame and Qantas Founders Museum and the welcome return of the Waltzing Matilda Centre – bigger, brighter and more engaging than ever – and of course there are the classic pubs and genuine Aussie characters that make Outback Queensland an experience like no other. It’s a region that resonates with the origins of some of Australia’s most treasured icons, from our unofficial anthem ‘Waltzing Matilda’, to the beginnings of the Royal Flying Doctor Service and the birthplace of Qantas. The landscapes are breathtaking, from arid plains and gibber desert to rocky ranges, wide savannah to dry riverbeds that can fill during the wet season and flow with life, and areas that abound with wildlife around the rivers, waterholes and gorges. Spectacular naturals highlights range from the red dunes of Windorah to the emerald waters of Lawn Hill Gorge and the dinosaur trail that traces the prehistoric pathways of creatures from 95 million years past when Outback Queensland was home to an inland sea. The first thing to note is just how big Outback Queensland is – around half of Queensland or around 832,000km2 that is defined by the State borders on the west and south, the Overlanders Way in the north, and it stretches west of the Great Dividing Range in a line that arcs from Hughenden in the north to Charleville and Cunnamulla in the south. It’s a vast area with big distances between its small communities that make Queensland the most decentralised of all of Australia’s states. Plan plenty of time or set your itinerary to take in one or two of the main sectors of Outback Queensland. Our guide will help focus on what each offers. The Central West is the heart of the outback and the gateway to this great region. It includes the towns of Longreach, Barcaldine and Blackall and out to dinosaur country at Winton. This region is home to some of the legends of Australia’s bush heritage – Waltzing Matilda was penned here, Qantas was ‘born’ here, and the folklore and stories of the bush from the stockmen to shearers were played out here. The main centre is Longreach – home to some of the biggest attractions of the outback. The wide brown landscapes and shimmering horizons surrounding Longreach offer the promise of adventure, while the township’s heritage and attractions give plenty of opportunity to discover what life was like here for the early settlers. Close to the airport is the outstanding Qantas Founders Museum. Displays turn back the clock to the 1920s and follow the story of the airline from its inception in Winton up to modern day. You can see the original heritage listed Qantas hanger containing DH-50 and DH-61 aircraft. For the best QFM experience, join a guided tour of the resident Boeing 747 and 707 plus the unusual Catalina Flying Boat. Add a 747 Wing Walk or try your hand at ‘flying’ with the Flight Simulator Experience. Head down Longreach’s long main highway to the Australian Stockman’s Hall Of Fame established in 1988 by legendary outback figures, artist Hugh Sawrey and stockman outfitter RM Williams. The landmark attraction tells the story of outback pioneers from Aboriginal people to the explorers, the overlanders, cattle drovers and early settlers. You can then relive the age of the pioneers with Kinnon & Co. on one of their colourful outback experiences. Go back in time with the Cobb & Co Stagecoach Experience on an exhilarating gallop along a section of the original Longreach-Windorah mail route. Other experiences include a visit to the Nogo Station, a working station where you can see sheep shearing and enjoy a traditional morning tea. Complete your day with a leisurely sunset cruise down the Thomson River as the red and orange hues of the sun echo the colours of the outback. Around 180km northwest of Longreach is the Dinosaur Capital of Australia, the historic town of Winton. A.B. ‘Banjo’ Paterson famous national poem and song “Waltzing Matilda” was penned at nearby Dagworth Station and first performed at Winton’s North Gregory Hotel on 6th April 1895. The iconic Waltzing Matilda Centre was destroyed by fire in 2015, however the magnificent new Waltzing Matilda Centre opened with much fanfare in April this year along with a star packed celebration at the Way Out West Festival. The Australian Age of Dinosaurs Museum of Natural History is just 24km out of town and has guided tours. Visit the Fossil Preparation Laboratory to learn how dinosaur bones are recovered and how the fossils are carefully prepared to museum quality and get to touch a real dinosaur fossil. The Collection Room’s fossils include “Banjo” – an Australovenator wintonensis, a carnivorous dinosaur around 5m long, and a sauropod, Diamantinasaurus matildae – “Matilda”, a much larger herbivore. For more of Outback Queensland’s dinosaur history, take the trip out to the Dinosaur Stampede at Lark Quarry Conservation Park, to see the world’s only known record of a dinosaur stampede in preserved footprints. Located some 110km southwest of Winton, in Jump Up country, the Dinosaur Trackways are only accessible on a guided tour. Winton’s other attractions include the Royal Open Air Theatre, which is the last remaining outdoor cinema in Australia. This year’s Vision Splendid Outback Film Festival is to be held in Winton from 29th June to 7th July featuring Australian films. The Matilda Highway connects to communities including Ilfracombe and Barcaldine just over 100km to the east of Longreach. Since the late 1800s, this region has been known for its sheep and cattle production. Barcaldine was the site of the Shearers’ Strike of 1891; the historic event is marked by the Tree of Knowledge sculpture, which includes trunk and branches from the original iconic tree. Blackall is home to the heritage Blackall Woolscour, Australia’s only complete steam-fired woolscour that still operates during shearing season from May to August. See the Jack Howe Memorial Statue and learn about the history of the town. Jack Howe, or ‘Jackie’, still holds the record for hand shearing – an amazing 321 sheep in 7 hours and 40 minutes. When you explore the town look out for the famous ‘Black Stump’ – used by surveyors for their theodolite when mapping the state boundaries back in the 1900s. For a revitalising swim take the plunge in the artesian spa at the Blackall Aquatic Centre. More outback hospitality is on offer at Tambo, the oldest town of the Central West. See the birds and wildlife at Tambo Dam, visit the Tambo Grassland Art Gallery and buy one of the pure wool Tambo Teddies, made right here in Tambo. The Far West is Channel Country, home to the Diamantina River and Cooper Creek that flow into Lake Eyre. The endless horizons and dramatic landscapes of the Diamantina and the Munga-Thirri (Simpson Desert) National Parks are part of this region, which is home to the remote communities of Birdsville, Bedourie, Windorah, Jundah, Stonehenge and Boulia – famous for the mysterious Min Min Lights. Near Windorah take a Nature Drive through the changing landscape to Cooper Creek. If you enjoy fishing then try your luck with the yellowbelly and camp under the stars. 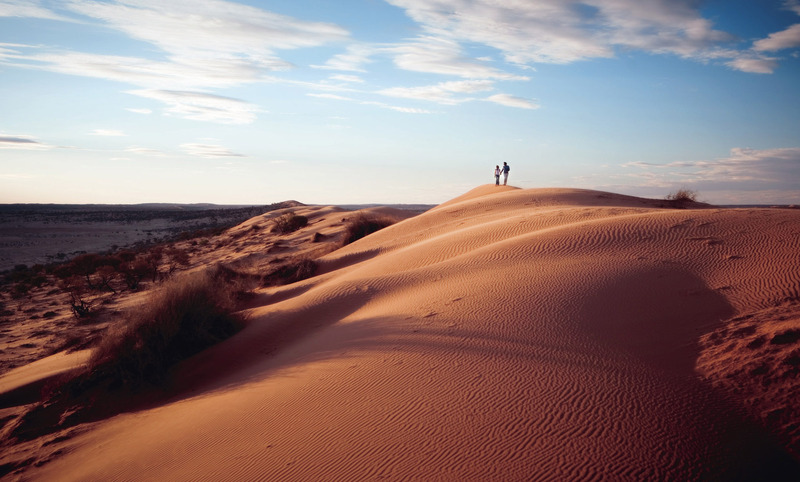 Take a trek up the vast red sand dunes around sunset for some breathtaking views to really appreciate the beauty of this incredible part of Australia. At Jundah enjoy more fishing from the banks of the Thomson River, while out west of Windorah is the ghost town of Betoota, which only comes alive for the annual gymkhana and races. Still further west is the legendary town of Birdsville, home of the famous Birdsville Hotel. For most of the year the population of this isolated community is just over a hundred, but in early spring the town plays host to some 8,000 visitors who come for the famous Birdsville races. This year’s Birdsville Races are held from 31st August to 1st September. To the south is the Birdsville Track, while to the north is Bedourie, the administrative centre for the Diamantina. Just under 200km north of Bedourie, is the town of Boulia where you may just have an encounter with the mysterious, hovering Min Min Light. Over the last century sightings have been made by locals and visitors and you can learn more about the light at the Min Min Encounter Tourist Centre. At the Stonehouse, discover the history of the region and the early pioneers. The Stonehouse was built in 1880, one of the first buildings constructed in Western Queensland. Today it houses Boulia’s marine reptile fossils, including an adult Icthyosaur skull. The town is the venue for the annual Boulia Camel Races (20th to 22nd July), Australia’s longest camel race. In Outback Queensland’s South West region are the communities of Charleville, Cunnamulla, Eulo and Thargomindah in the heart of the Great Artesian Basin. Out west of Charleville is the town of Quilpie, famous for its beautiful opals. Visit the museum and learn about the famous Quilpie boulder opal, or try your luck fossicking in the digs at Quilpie or Yowah. The major centre for the South West is the historic town of Charleville with plenty for visitors to see and enjoy. The stars are never more beautiful than in the clear sky of the outback, so head to Charleville’s key attraction, the Cosmos Centre & Observatory for some truly amazing sights in the night sky. Here you can hold a shooting star, learn about the stars and planets, and observe the Milky Way through powerful 12-inch telescopes. Charleville’s Bilby Experience is another favourite amongst visitors. You can join a night tour and learn about the passionate conservation efforts to save this endangered marsupial. There is local history to discover at the Historic House Museum and at the Royal Flying Doctors Visitor Centre; and visit the famous Hotel Corones – one of Outback Queensland’s iconic and grandest pubs. There’s more to see at the Charleville School of Distance Education or go on a weather station tour. Back in 1922, the first Qantas mail service took off from here on its maiden flight to Cloncurry. The North West region follows the Overland Way out west from the tropical city of Townsville to Hughenden, Richmond, Julia Creek, Cloncurry, Mt Isa and Camooweal. Hughenden is the northern starting point of the Dinosaur Trail that includes Richmond as well as Winton in the Far West. It lies on the edge of the former Great Inland Sea that is a rich source of dinosaur and marine reptile fossils from the Cretaceous period. See the collection at The Flinders Discovery Centre including ‘Hughie’ the 7m skeletal model of a Muttaburrasaurus. Next stop on the trail is Richmond and a remarkable collection of marine reptile and dinosaur fossils at Kronosaurus Korner. See Australia’s largest fossilised fish and a giant Kronosaurus queenslandicus, and watch the preparation of fossils in the laboratory. Known as the ‘Friendly Heart of the Great North West’ Cloncurry was the birthplace of the Royal Flying Doctor Service. Visitors can find out more about the RFDS and see the ‘Radio Gallery’ at the John Flynn Place Museum and Art Gallery. More history can be found at Cloncurry Unearthed – the Visitor Information Centre and Museum that houses a water-bottle belonging to explorer Robert O’Hara Burke, as well as Indigenous artefacts and an extensive collection of minerals and gems; and it’s here too that you can pick up a fossicker’s license. Cloncurry is host to some major annual outback events starting with the Campdraft in May and the Cloncurry Show in June. Calendar highlights are the Cloncurry Stockman’s Challenge and Campdraft which this year will be held from 11th to 15th July with equestrian, campdraft and rodeo action; and the Curry Merry Muster Festival held over the first weekend in August (3rd to 6th) with a leading rodeo, teddy bears’ picnic, bush poets and street parade. The mining city of Mt Isa is the largest centre in Outback Queensland, with a population of over 20,000 people. At Outback at Isa visit the Hard Times Mine, where you can descend deep underground on a guided tour to experience how a mine works. Discover some of the city’s pioneering history, or travel further back in time with the Riversleigh Fossil Centre with fossils collected from the Riversleigh fossil fields some 250km to the northnear Boodjamilla (Lawn Hill) NP. The city also plays host to the annual Mt Isa Mines Rotary Rodeo (9th to 12th August 2018). As you travel through Outback Queensland make a point of visiting some of the iconic pubs that are not only welcome watering holes, they are also home to Australian bush history, anecdotes, folklore and even notoriety. Our national song – Waltzing Matilda – was first performed at Winton’s North Gregory Hotel in 1895 and in World War II a young American pilot, future President Lyndon B Johnson, stayed at the same hotel after a forced landing at Carisbrooke Station. North of Winton two small but significant scrub pubs capture the essence of the outback. The Blue Heeler at Kynuna is near to Combo Waterhole where the events in Waltzing Matilda transpired, while the Walkabout Creek Hotel at McKinlay was made famous as Mike Dundee’s local in the classic Australian film Crocodile Dundee. Head south to Charleville home to the grand 1920’s Corones Hotel. Further south the stone built Noccundra Pub and The Eulo Queen, named after its infamous one time owner, are also worth a visit. But perhaps the most famous of all is one of the most remote – the Birdsville Pub – a focus for the annual Birdsville races held each September. Autumn and winter are the ideal times for visiting the outback, the days might be getting cooler, but the action is heating up with outback events cramming the calendar for autumn and winter. Everything from campdrafts to rodeos, picnic races and musters, festivals and fishing competitions, and the traditional country shows. It’s a great time for discovering the heartland of so much of Australia’s heritage. What Floats Your Boat and Wheels?